So today I've decided to share my very own thoughts on both the St Moriz Dark and L'Oreal Sublime Bronze Tanning Mousse. As you probably already know I am fairly pale and I never ever tan nor do I think I ever will :( boo! I wasn't blessed with the gorgeous olive tan unfortunately. I guess this post is kind of bad timing with the summer ending and the sun disappearing but like many I still choose to fake tan through autumn and winter. 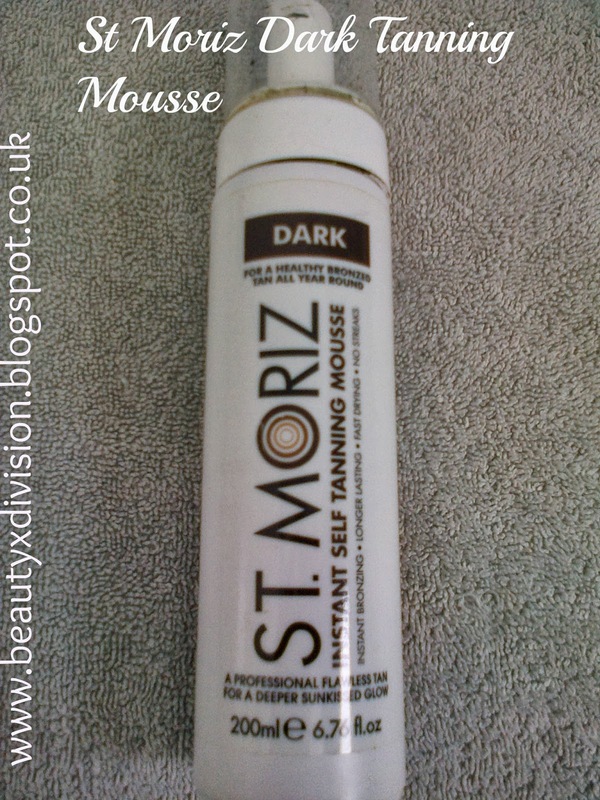 Starting with the St Moriz Dark Tanning mousse, I heard about this through various beauty blogs, youtubers and I also read some reviews about it online. It's extremely cheap and an absolute bargain at only £4-£5 for a 200ml bottle and you can buy them from various stores such as Tesco's, Superdrug and Boots and you may find them in discount stores near you. The pump dispenses the mousse quite easily and application is fairly easy too.. You can see where your applying it and it's a streak-free tan. The best time to apply this tan is before bed so you can give it time to sink into the skin and the next day you can wash it off in the shower in the morning. On the back of the bottle it says that is must be washed off after 4-6 hours. I was worried that the tan would come off but it doesn't wash off all the tan, it leaves you with a lovely glowing dark tan. 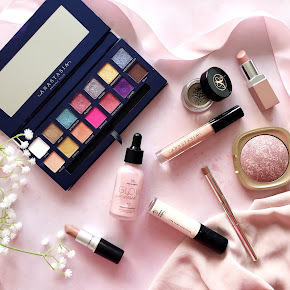 I was so impressed with how this turned out but the trick to keeping the tan looking good and not patchy is to exfoliate the skin lightly and moisturise 2-3 days after application. 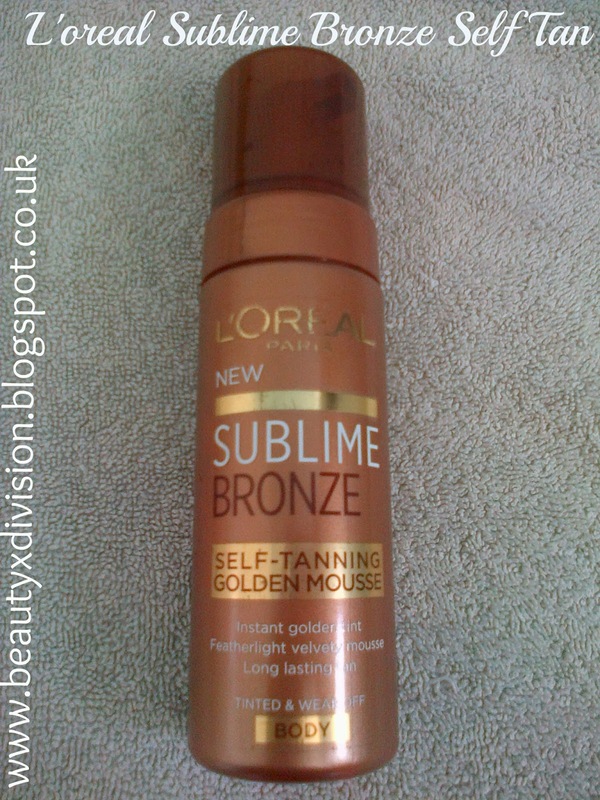 Now, onto the L'Oreal Sublime Bronze Tanning Mousse.. I've heard so many people raving about this so I picked it up from my nearby boots store and I bought this for £10-£15 which is more than double the price of the St Moriz Dark Mousse. I was very intrigued by what it says on the back of the bottle.. It says 'Infused with golden particles for a subtle shimmer this sumptuous mousse gives a radiant but natural looking tan. A featherlight mousse that melts into the skin and is easy to blend leaving no sticky residues'. After reading this I had such high expectations of this tanning mousse and I expected it to be everything it had stated itself to be. I have to agree with what they said though! This mousse really lived up to my expectations because when I applied this tan it looked so natural and it was super easy to blend in. You could tell where you were applying it so you can blend it in easily leaving you with a lovely streak free tan. The L'Oreal Sublime Bronze Mousse is best to use in the summer because of the shimmer in the tan. Excuse the green mitt! It's due to tanning a little bit too much, oops.. I think I need to buy myself another one soon. 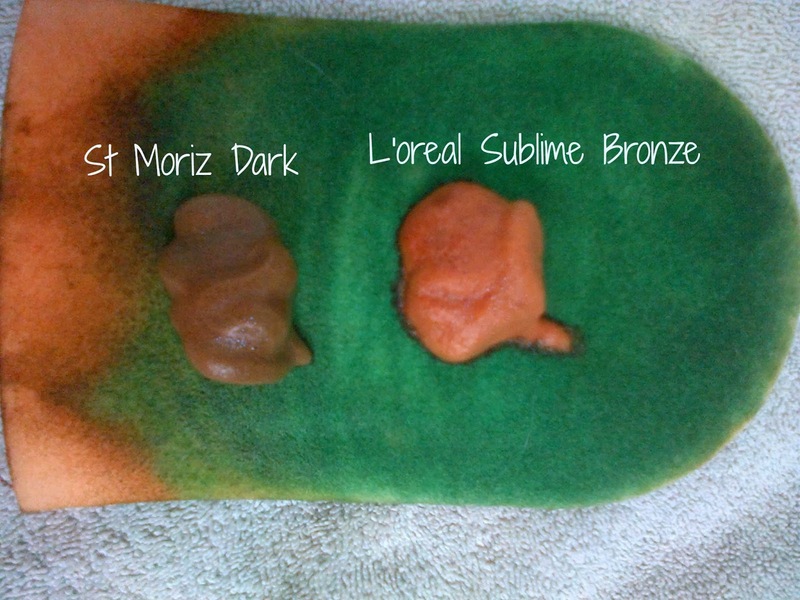 Anyway if you look at the St Moriz Tan it looks quite dark compared to the L'Oreal Sublime Bronze. The L'Oreal Sublime Bronze has a nice golden natural tint to it and may look slightly orange but this shouldn't stop you from trying it as it will look incredibly different when you've applied it. I absolutely love both tans and I adore St Moriz, it's a good dupe for St Tropez fake tan and a bargain too. Have you tried any of these fake tans?